The coconut tree is often referred to as 'The tree of life", and rightly so, as it can be used in so many wonderful and versatile ways. When people think of the coconut tree the nut is generally the first thing that comes to mind, but there is also a sweet nectar that comes from 'tapping' the flowers of the coconut palm. 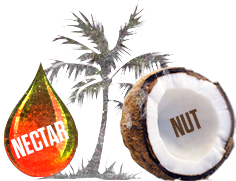 Below we have developed a cheat sheet of all the different products that can be made from the coconut tree. Every month a new inflorescence appears at the top of the coconut palm. Harvesters climb the tree, bind up the emerging flower bud, slice off the tip, hang a cup beneath it and return every few hours to collect the sweet dripping sap (also called blossom nectar or "toddy"). In some places they climb the tree several times a day while in other places a spider's web of ropes lets the harvester move from tree to tree without coming down. The nutrient-rich sap has 17 amino acids, a range of minerals and can be fermented into cider which then makes a vinegar better than famed apple cider vinegar. The fresh sap can also be reduced to make syrup or crystallised into sugar. Mixes of syrup, vinegar and spices are further blended, fermented and aged to produce a range of delicious sauces known for their flavour and nutritional profile. There was a time when the only coconut most Australians ate was on a lamington, but the "Tree of Life" has yielded a plethora of fine foods and useful resources along tropical coasts for millennia. And today artisan chefs are presenting more options all the time. Every month a new frond emerges at the top of the palm along with a new bunch of flowers. The flowers are fertilised and become golf-ball sized coconuts that grow and grow until at 12 months of age they are as big as rugby balls and fall to the ground, protected by their thick husk. If they are growing by a river or on the beach the coconut will float away and perhaps wash up on a coral atoll to start a new coconut grove. Or, more likely, it will be picked up by the farmer who planted the tree! Botanically, the coconut fruit is a drupe, not a true nut. Like other fruits, it has three layers: the exocarp, mesocarp, and endocarp. The exocarp and mesocarp make up the "husk" of the coconut. Coconuts sold in the shops of nontropical countries often have had the exocarp (outermost layer) removed. The mesocarp is composed of a fiber, called coir, which has many traditional and commercial uses. The shell has three germination pores (stoma) or "eyes" that are clearly visible on its outside surface once the husk is removed. Coconuts have been selected over the millennia and different varieties range from fist sized to heart shaped coconuts weighing over 3kg. Carefully managed, coconut nectar can be fermented and aged to increase its amino acid content and develop delicious flavours. Coconut seasoning sauce, or Amino Sauce, is increasing in popularity as a healthy alternative to Soy Sauce (with less sodium and no soy). It works well as a salad dressing and marinade, in soups and stir-fries, with vegetables and rice, meat and sushi. The nutrient-rich nectar or "sap" collected from the coconut blossoms contains 17 amino acids and a range of minerals. If left overnight it begins to ferment into an alcoholic cider or palm wine known as "toddy". Careful fermentation turns pure coconut blossom nectar into alcoholic cider/wine. Further fermentation converts the alcohol to acid and correct aging brings out some excellent flavours. The best coconut vinegars contain all of the natural "mother" (protein-rich yeast bodies) and are nutritionally richer than the better known Apple Cider Vinegar. Between 50 and 200mm thick, the husk surrounds the hard brown shell and enables a coconut to fall safely from a 30m tall palm and float on the sea to grow on a new beach. One third of the husk is made up of Coir Fibres 100 to 300mm. They have more lignin and less cellulose than flax or cotton so are stronger but less flexible. Coir fibre is relatively waterproof and is one of the few natural fibres resistant to damage by saltwater. Made into durable rope for boats, nets and construction. Once considered a waste product coconut pith is now valued as Cocopeat, used in horticulture as an ecologically sound alternative to fossil peat moss. Coir waste from coir fibre industries is washed, heat-treated, screened and graded before being processed into cocopeat products of various granularity and denseness, which are then used for horticultural and agricultural applications and as industrial absorbent. Usually shipped in the form of compressed bales, briquettes, slabs or discs, the end user usually expands and aerates the compressed cocopeat by the addition of water. A single kilogram of cocopeat will expand to 15 litres of moist cocopeat. The woody protective coating around the flesh is the familiar "face" of the coconut. It changes from white to brown as it matures and hardens. Coconut shell is used for bowls, utensils, beads and buttons. It makes excellent charcoal for fuel and for production of high quality Activated Carbon for the absorption of gas and for the removal of colour, oxidants, impurities and odour from compounds. Activated carbon plays a crucial role in everything from water filters to gold refining. Coconut water packed in tetrapaks or cans has become very popular in gyms as a natural rehydration fluid due to its high potassium content. During WW2, the water from coconuts, being fresh, clean and sterile, was used for 'blood' transfusions in the Pacific and saved many lives. If the white flesh is not dried but grated and pressed it produces the coconut cream or milk (diluted cream) that we find in cans or tetrapaks. Coconut milk can also be spray dried into milk powder or centrifuged to produce virgin coconut oil. The dried flesh of coconuts is known as copra and is the basic "cash crop" traded from remote tropical coasts around the world. It is hard work to make and the returns are very low so production is declining. Copra is shipped to mills where big screw presses expel crude copra oil. Alternatively, chemicals including dangerous hexane are used for solvent extraction of the oil. Either way, copra oil must be Refined, Bleached and Deodorised to make it edible. It is a bland pale yellow oil. The dried flesh of coconuts is known as copra and is the basic "cash crop" traded from remote tropical coasts around the world. It is hard work to make and the returns are very low so production is declining. Copra is shipped to mills where big screw presses expel crude copra oil. Alternatively, chemicals including dangerous hexane are used for solvent extraction of the oil. Copra oil must be Refined, Bleached and Deodorised to make it edible. It is a bland, odourless pale yellow oil used as cooking oil and as an ingredient in food manufacture. It is valued in soap making because it lathers very well. Grating and squeezing fresh white coconut flesh yields Cream (>24% Fat) which is an emulsion of oil and water with proteins and sugars. Extra water is added and the gratings squeezed again to produce Milk (<17% Fat). Made daily in coconut growing regions, it is a key ingredient in many cuisines. Cream and Milk are commonly preserved in cans and TetraPaks usually with added thickeners and emulsifiers but pure coconut products are available. Coconut oil is the "active ingredient" for health and flavour so avoid paying for water with a diluted product. Coconut Cream is also preserved by spray drying like is done with dairy milk. Cream allowed to sit in a bucket overnight will ferment and go "off" thus breaking the oil/water emulsion into separate layers that can be skimmed off. Various treatments done to Cream, along with the high centrifugal force of an industrial centrifuge spinning at very high speed, separates out the oil. Fresh coconut flesh is pared to remove the brown testa then sliced into large pieces and air dried into flakes or chips widely used in baking and muesli. Flakes are toasted or sweetened (preferably with coconut sugar) and toasted to make a delicious snack. Fresh coconut flesh is pared to remove the brown testa then sliced into thin slivers and air dried into shredded or desiccated coconut popular around the world in cooking. Creamed Coconut or Coconut Butter is whole coconut meat, in concentrated form. The white coconut flesh is dried to remove the water and then ground to a fine paste or "nut butter". Creamed Coconut has a smooth creamy consistency due to its high (70%) fat content. It is therefore a rich dietary source of healthy coconut oil. Uniquely rich in healthy Medium Chain fatty acids, freshly processed virgin coconut oil is now being called "the healthiest oil on earth" (Dr Jon Kobara). Hand made for millennia in the tropics, most virgin coconut oil today is made in a Desiccated Coconut factory where dried coconut meat is screw pressed under high pressure and elevated temperatures to expel food grade oil. Dr Dan Etherington of Kokonut Pacific invented the Direct Micro Expelling (DME™) process which in less than an hour takes selected mature coconuts, grates, dries and hand-presses them into Extra Virgin Coconut Oil. This Australian technology is the quickest process in the world and along with strict quality controls locks in all the flavour and goodness. Food - The world is beginning to value what one of the original researchers called "The healthiest oil on earth". It has the highest level of healthy Medium Chain fats (also present in human mothers’ milk) found in any oil. These are easily digested, improve metabolism and protect from both infectious and lifestyle diseases. The best Extra Virgin Coconut Oil has a warm coconut flavour which is an indication that all the key nutrients are still present. Skin Care - For centuries traditional healers from India (Ayurveda) to the South Pacific have used raw virgin coconut oil as a medicine and as a massage oil to soothe and cool the body, alleviate skin ailments and soften skin to helping prevent wrinkles, sagging and age spots. It is a good moisturiser and is absorbed quickly by the skin so does not leave the skin feeling greasy. Biofuel - Coconuts are grown in some of the remotest corners of the globe where liquid fuel for engines and lamps can be unavailable or at least very expensive. During the crisis in Bougainville (Papua New Guinea) coconut oil was used to fuel diesel vehicles and Kokonut Pacific trained DME producers to make coconut oil lamps and run generators on second grade coconut oil. The best coconut flour is made by milling the meal that remains after virgin coconut oil (VCO) is pressed from fresh desiccated coconut. This coconut flour has almost 40% fibre, 20% balanced protein, 10% coconut oil, just 8% natural sugars and no gluten. These give it both fabulous flavour and great nutritional value. Coconut flour that has been very finely milled works best for baking, cooking and smoothies. With a rich caramel flavour and gold to brown colour, pure coconut sugar is becoming recognised as a sustainable, low GI, mineral-rich sweetener. Evergreen perennial coconut palms, the Tree of Life, produce on average more sugar per hectare than sugar cane while using less nutrient for production - hence its reputation as the world’s most sustainable sweetener. Use 1:1 as a replacement for brown sugar in any recipe. Farmers climb the coconut palms and harvest the blossom nectar by carefully slicing the flower bud, attaching a cup and returning every few hours to collect the dripping nectar. Once harvested the nectar is transferred into kettles where the evaporation process lowers the moisture content of the nectar until it becomes a thick syrup which should have a brix count of 75 to 81. Six litres of nectar must be reduced to make one litre of syrup which is nutritionally superior to Agave, Corn and Maple syrups. Good coconut syrup has a warm caramel flavour which is delicious on pancakes, waffles, and ice cream, in smoothies and hot drinks or as a glaze on both vegetable and meat dishes.